The head of the bed consists of two independent pillows, pillows are available in the same color as the headboard or in contrast finish. The inner frame of the model is a metal tube, the soft filler is a polyurethane foam. Available upholstery fabric or leather in different colors. 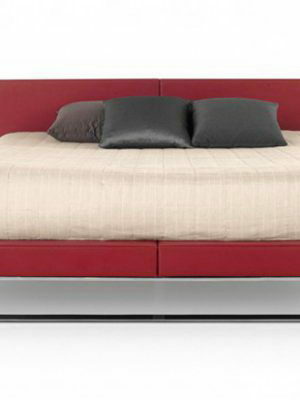 The elements that give the Lazy collection its unique character are revisited in the headboard of a new bed by Patricia Urquiola, which was designed in both double and single versions. In the double version, the headboard consists of two independent elements and is softened by cushions that are supported by an elastic strap in the same shade as the fabric or leather upholstery, or in contrasting color. 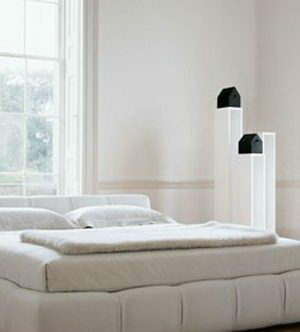 Adjustable in height, the cushions can be placed in a comfortable position for reading or watching TV. Two tubular metal supports hold up the frame; a version of it is easy to move. The base frame contains a metal mesh with pre-curved beech wood slats.